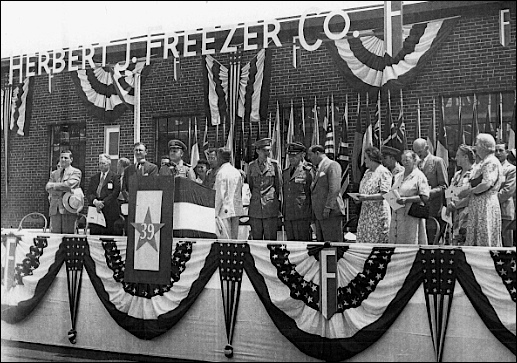 The H. J. Freezer Company is a mystery to most people in York County. Why did their Spring Garden Township plant receive the Army-Navy “E” Award? When quizzed, most people incorrectly guess the H. J. Freezer Company had something to do with freezers. I’m familiar with this plant through hearing about it from my mother, Esther L. Smith; she worked there from 1941 until 1944. Additional details are via finds at the Library of Congress in 1996. 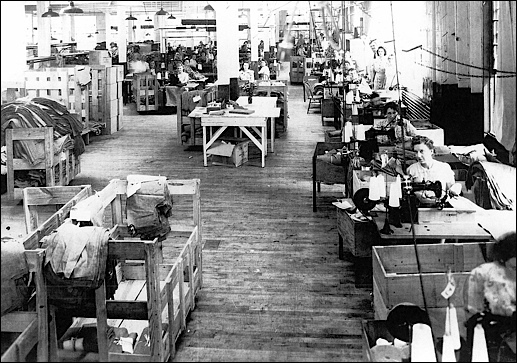 The production of quality Army and Navy apparel, always delivered well ahead of schedule, put the H. J. Freezer plant in the forefront with the military. 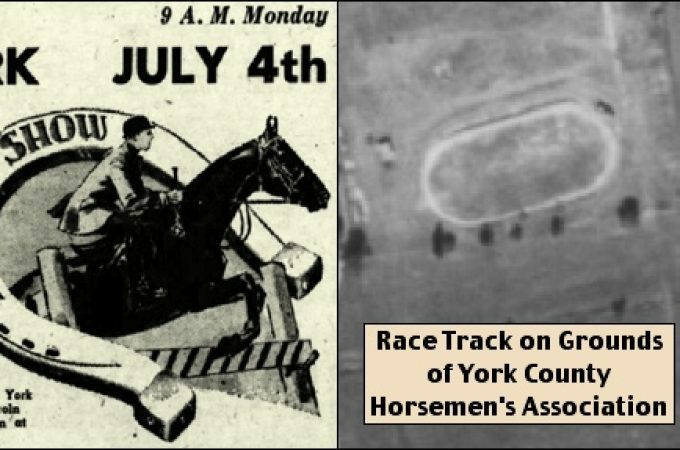 Per the records of the Manufacturer’s Association of York, H. J. Freezer was the first company in York County to engage 100% in war work. They immediately discontinued ALL civilian production upon winning their first defense contract in March 1941; nine months before Pearl Harbor was attacked. 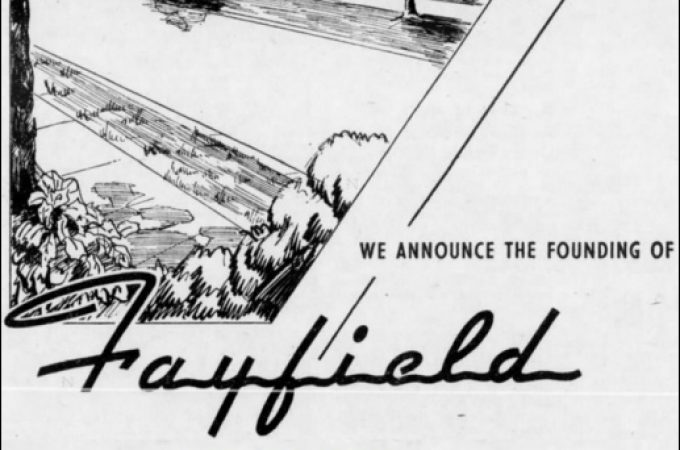 Thereafter the company won a continual run of military apparel contracts, keeping an average workforce of 450 fully engaged in war work until the end of World War II. 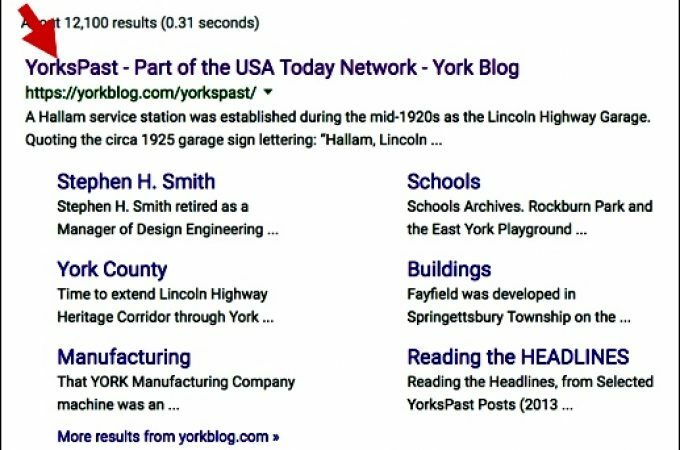 Herbert J. Freezer came to York in 1934 and was associated with Phillip G. Bernstein in the H. J. Freezer Company. 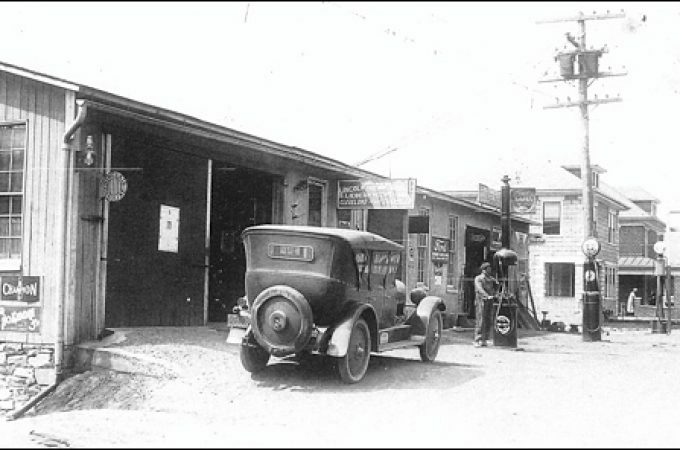 Their Spring Garden Township plant was constructed adjacent to north side of the Pennsylvania Railroad tracks, to the eastern side at the north end of East Street. At one time the company was a franchise manufacturer of Fruit of the Loom shirts. The plant gained their first experience delivering on government contracts during the 1930s, when they furnished cotton shirts to the requirements of the Civilian Conservation Corps. One of their early contracts in 1941 called for Army jackets made with a new material which was heavy to handle and difficult to get through the sewing machines. Suggestions by the employees allowed Singer Sewing Machine Company to produce custom machines, which allowed faster throughput. During the war, the president of the company, Herbert J. Freezer was frequently called to the Philadelphia Quartermaster’s Depot as a consultant on clothing problems from other manufacturers. 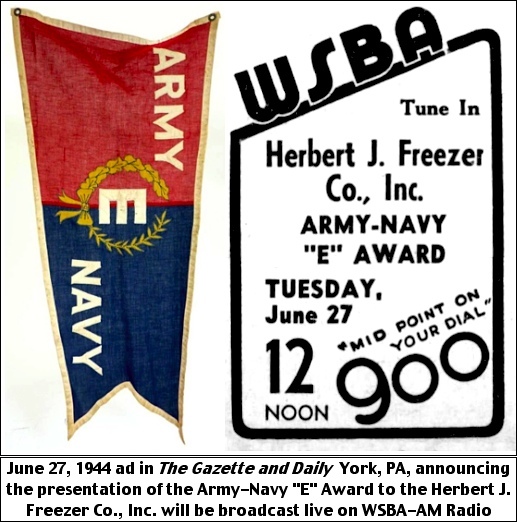 The H. J. Freezer Company had delivered on a string of Navy contracts, when they were notified about the Army-Navy “E” Award. Presenting the award was Lieutenant Commander Roy G. Buck, who was in charge of the Research and Control section, Clothing division and Supply group of the Bureau of Supply and Accounts, Navy Department, Washington, D.C.
“You will start working at 7 o’clock in the usual manner and work until 11:45. Starting at 11 o’clock guests will tour the plant. Please do not let this interfere with your work. Rather let it be an incentive for you to work all the harder. Although we know this reminder is not necessary, please do not stare at the guests.” The following is an interior view of the plant, which the visiting dignitaries would have seen on June 27, 1944. “The plant inspection will be over at 11:40. At 11:45 the buzzer will sound. You will remain at your machines until given the signal from your usherette, at which time you will march, by twos, to the courtyard and take your seats. It will not be necessary for you to ring your time cards out or in at noon.” The following view of the courtyard is at about 11:46, as the first employees exit the plant and head for their seats. The Spring Garden Band is in the upper left, in the courtyard; as they provide the musical prelude, prior to the ceremonies. Starting precisely at Noon, an invocation by Rev. J. H. Arnold, is followed by the, entire assembly and soloist Charlotte Katz Cohen, singing the Star Spangled Banner. 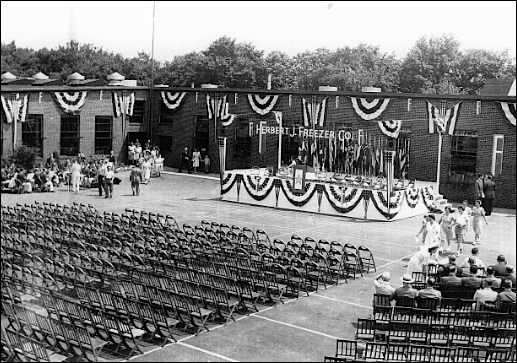 The following photo shows the speaker’s platform during the ceremonies. 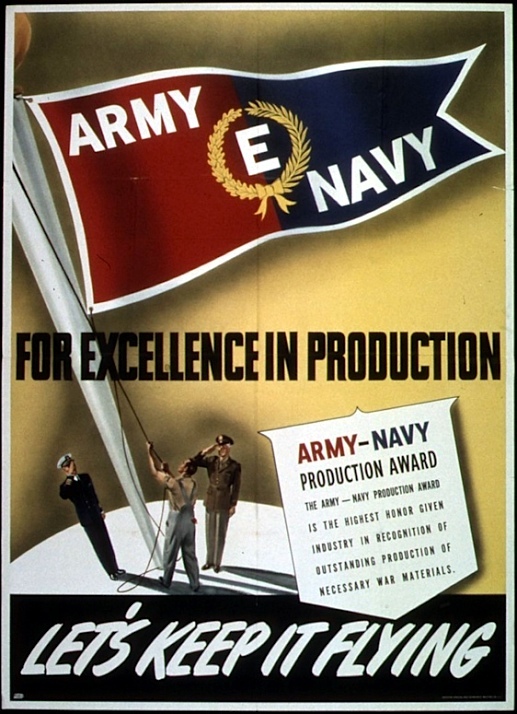 With nineteen war-production plants granted the WWII Army-Navy “E” Award, York County is tied at fourth place with Erie County for the most in Pennsylvania. 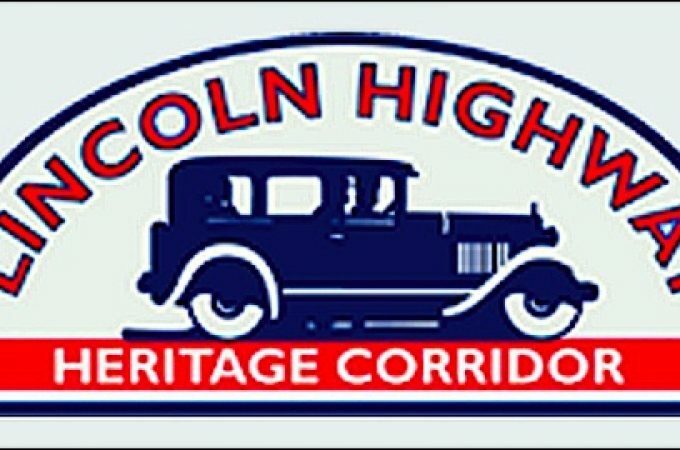 Philadelphia County is first with 103 Awards. Allegheny County, with Pittsburgh, is second with 62 Awards. Montgomery County is third with 21 Awards. Jim McClure suggested normalizing the results by County population. I’ve used 1940 United States Census results for the normalization. Dividing the number of Army-Navy “E” Awards into the County population yields the Amount of Population in the County per each Army-Navy “E” Award in that County. A lower value may be thought of as indicating a more efficient utilization of resources. 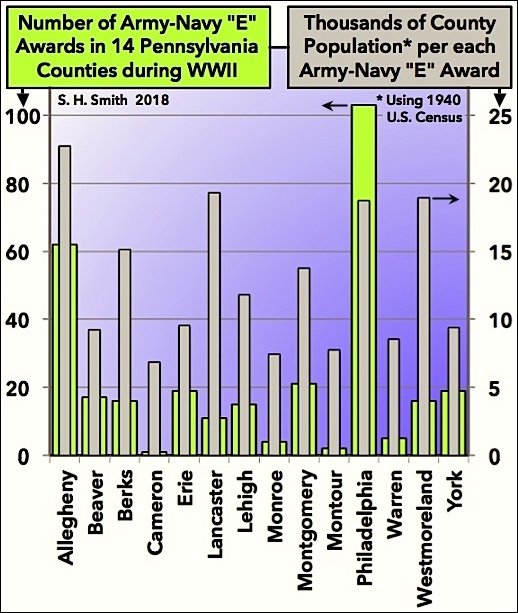 With a population of 9370 per each WWII Army-Navy “E” Award, York County is sixth best in the State, again nearly tied with Erie County at 9520. Cameron County is best at 6852. Monroe County is second with 7451. Montour County is third with 7733. Warren County is fourth with 8558. Beaver County is fifth with 9221. Those values are shown as the silver columns, using the scale on the right side of the following graph. In the chart, I’ve selected 14 counties; chosen with highest number of awards and/or indicating the most efficient utilization of resources.